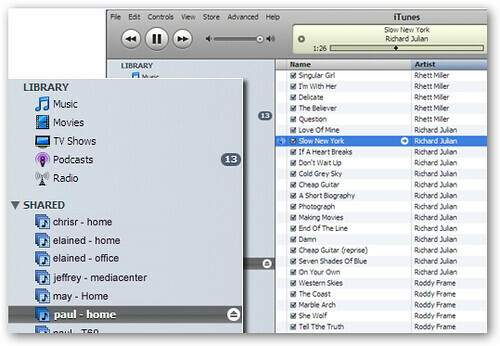 Simplify Media lets you connect to your personal iTunes music library from anywhere in the world. You can also invite your friends to listen in with you and vice versa. Music is streamed over the Internet so you can access your library and that of your friends' anytime and anywhere. The only catch is that your personal computer has to be turned on for it to work. An alternative solution called Avvenu Music Player uploads your songs online so you don't have to keep your computer on all the time, but it has a 250 song limit. Once you install the Simplify Media software, you can designate folders that you want to be publicly accessible and set up a username and password to access the music on your computer. You can also send invitations to your friends to give them access. One limitation is that to listen to your music remotely, the computer you are using will need to have both iTunes and Simplify Media installed. Although only Apple iTunes 7 is supported right now, support for Winamp and Windows Media Player is upcoming. For a software-agnostic solution, check out Orb Networks.